The fascinating story of a superpower using music to make friends in the Middle East. During the heydays of the Cold War, when The United States’ image in the world was badly damaged, Adam Clayton Powell, the US representative for Harlem, went to the State Department with a rather revolutionary idea. In order to change the perception of the US abroad, the world needed to get to know the “real America”, not the America of racial segregation, the cultural wasteland, or the military giant, but the land of cultural freedom and modernity, the swinging America. Powell suggested that if they sent jazz musicians to the regions that were at risk of falling under Sovjet influence, these “Jazz Ambassadors” could create goodwill and change the people’s perception of America through their music. One of the regions that were supposedly at risk of becoming a breeding ground for communism was the Middle East, and so the area quickly became one of the focus points of the so called “Jazz Diplomacy”. In 1956 bebop trumpeter Dizzy Gillespie was sent to Beirut, and subsequently to Dacca, East Pakistan, prompting one Pakistani editorial to argue that “The language of diplomacy ought to be translated into a score for a bop trumpet”. Pianist and composer Dave Brubeck visited the Middle East in 1958, on the eve of a major political crisis, and played in Iraq, Iran, Pakistan, Afghanistan and Turkey, where he invited local musicians to join him onstage in a jam session of All the Things You Are. In ‘61 Louis Armstrong charmed the Egyptians with his trumpet in Cairo, even playing in front of the Giza Pyramids, on the back of a camel. The renowned composer, pianist and band leader Duke Ellington became the most well-travelled Jazz Ambassador, touring the whole Middle East with his orchestra from 1963. Syria, Jordan, Afghanistan, Pakistan, Iraq, Iran, Lebanon and Turkey, the Duke charmed the local people everywhere he went. He was also eager to learn from local musicians and the Middle Eastern musical traditions. Ellington’s encounters with unfamiliar musical forms resulted in his album Far East Suite, which blends the original American blues with Eastern musical approaches. Powell’s idea of Jazz as a “secret sonic weapon” (as a 1955 headline in the New York Times put it) turned out to be a great move and the Jazz Ambassador Tours made a big impression on the people in the Middle East, attracting huge enthusiastic crowds. The Ambassadors themselves also took away much from the tours, and for some of them the Oriental musical styles became a big influence on their own music. However, the musical cross-fertilisation worked both ways, and thanks to the Tours, jazz was introduced to the whole of the Middle East. 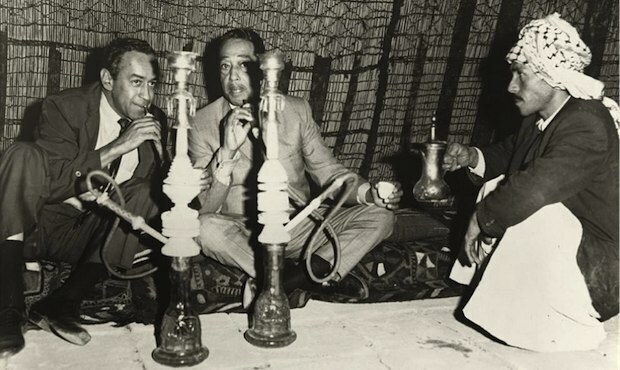 While jazz never became as mainstream as it was in the West, it did leave a profound impact on Middle Eastern music, which resulted in the emergence of Arabic jazz as a recognizable subgenre. Early jazz pioneers in the Middle East like Samir Suroor and Abdel Halim Hafez began introducing the saxophone into their music, and used it in a more “oriental“ style. The Egyptian drummer and multi-instrumentalist Salah Ragab became a central figure in the history of jazz in the Middle East. In 1968 Ragab founded the Cairo Jazz Band, Egypt’s first real big band, mixing American jazz with North African music and combining jazz instrumentation and musical style with indigenous melodies and instruments like the nay (bamboo flute) and the baza (drum). In Lebanon meanwhile, the Rahbani Brothers musical duo also incorporated jazz elements into their music, and the later work of the famous singer Fairouz features many jazz songs, which were mostly composed by her son Ziad Rahbani. It was that same Ziad Rahbani that laid the groundwork for what we call the Modern Oriental Jazz movement. One of those Oriental Jazz musicians is the Tunisian born Anouar Brahem. Having studied the oud at Tunisia’s National Conservatory of Music, Brahem moved to Paris after graduating, in search of a new approach. In Paris, his encounters with new musical genres inspired him to fuse Arab classical music, folk music and jazz. Oriental jazz is still popular today, and artists like Rima Kheich and her band, Salma El Mosfi, who worked with Ziad Rahbani, the Egyptian actor and singer Mohammed Mounir and even the Tunisian popstar Latifa are all influenced by oriental jazz. Oriental jazz, much like Western jazz, was always reinventing itself. It quickly incorporated new trends and easily adapted to new musical styles. For example, the Tunisian oud player and vocalist Dhafer Youssef combines the mystical, ancient Sufi music with the textures of electric jazz. The Lebanese-French Toufic Farroukh for his part, mixes Arab strings and melodies with jazz and some low key dance beats. The use of typical jazz sounds like the double bass and the saxophone in combination with regional instruments like the oud, and the integration of ancient musical influences with jazz structures; it all shows that jazz is inclusive music. It absorbs, it integrates and it plays around with tradition and innovation. The end result is a vibrant palette of Middle Eastern sounds and sentiment, which when joined with the complexities of jazz music, forms a whole new musical genre. This diversity and virtuosity of jazz music and the jazz scene is exactly what the Jazz Ambassadors during the Cold War were told to show to the world. The message was that American jazz was all about freedom, and that by implication, America itself was a country where people enjoyed both artistic and social freedom. The Jazz Ambassadors needed to show the world that the US was not a scary imperial power but a country with a superior musical culture, a free and prosperous country, and that they simply wanted the rest of the world to share in that freedom. Once the Cold War was over however, the US cared less and less about their image in the world, not in the least their image in the Middle East. Diplomacy was replaced by hard power and military action became the political tool of choice. These days, there is again an understanding that the tarnished image of the America abroad can actually harm US interests, and so soft power is recognized once more as a powerful tool for “changing hearts and minds”. It is therefore no surprise that since a few years, the State Department again has a programme in music diplomacy. It’s called Rhythm Road, and has been organized by the famous Jazz at Lincoln Center in New York, sending 10 bands (including jazz and hip-hop) to 56 countries in a year. The aim of the programme is no longer to compete for geo-cultural primacy, but to build cultural and artistic ties with the countries involved. The saxophonist Chris Byars, on visiting Saudi Arabia, made a point of playing the music of Gigi Gryce, a jazz composer of the forties and fifties who converted to Islam, and changed his name to Basheer Qusim. While this sort of “clever musical diplomacy” might make the whole operation a little less authentic, some would say it serves a good cause. The aim of the former programme was to highlight the unique and superior character of American culture, whereas current Ambassadors send a more humble message. For the people in the Middle East, with their less-than-favourable experiences of the US, that message is bound to be music to their ears. Editor’s note: This is an updated version of an article that originally appeared on Your Middle East in 2013.